Outdoor gear company Patagonia won’t stop protecting public lands and the environment. Now, it’s helping the rest of us join in. On Wednesday, Patagonia launched a new website that connects everyday people to nearby environmental activism. This isn’t the first time Patagonia has taken steps to address environmental issues: It prides itself on being “The Activist Company.” The company has donated $89 million toward environmental work since it took on this mission. More recently, in direct opposition to the Trump administration’s move to remove federal designations of national monuments in Utah, Patagonia declared “The President Stole Your Land” in a bold splash page. So this latest move comes as no surprise—but that doesn’t make it any less coo. It’s easy for individuals to feel helpless or frozen about how to address climate change. Patagonia Action Works hopes to remedy that. “I’ve always known that the cure for depression is action,” said Patagonia Founder Yvon Chouinard, in a YouTube video on the program. 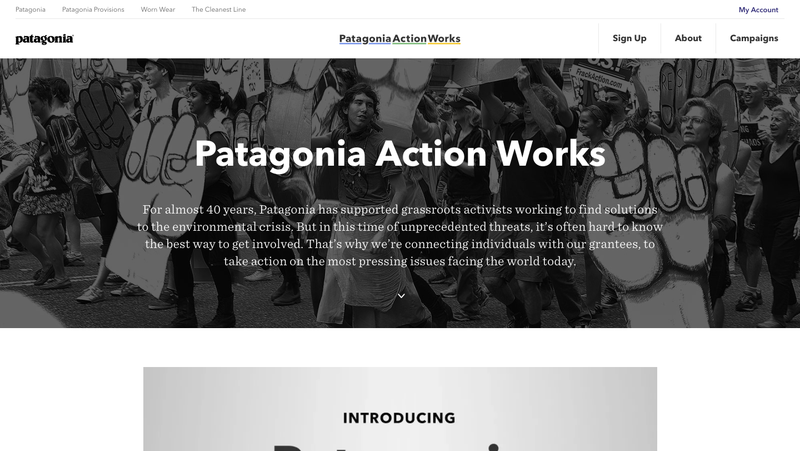 On the Patagonia Action Works website, users have the option to search by location and look into actions, organizations, and events around the world that focus on a range of environmental issues. Maybe someone is interested in helping restore native ecosystems, or perhaps they want to get involved in organizing around land and water rights. In New York City, where I live, I can discover organizations nearby doing work on zero waste and water conservation. However, if I decide I want to learn about only organizations doing work on biodiversity, I can find the local Audubon and Natural Resources Defense Council chapters. A national tour will accompany the launch of Patagonia Action Works, according to Forbes. The goal is to help community members connect with their local environmental organizations. Start planning that road trip now because Patagonia is hitting the streets Friday. The tour is headed to Santa Monica, California; Burlington, Vermont; Portland, Oregon; Washington, D.C.; Reno, Nevada; Austin, Texas; Boulder, Colorado; Chicago, and New York City (duh).